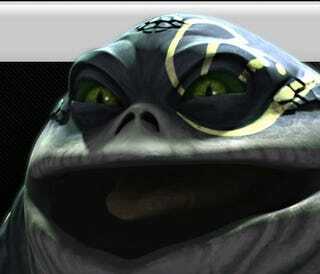 If you've spent any time watching Clone Wars, you know that Jabba the Hutt has a relative named Ziro who runs a nightclub and seems drawn from a Harvey Fierstein play. Or some kind of otherworldly Truman Capote impersonation contest (why does Ziro have a Southern accent when he lives on Coruscant?). Perhaps the best way to put it is that Ziro the Hutt is to gayness as Jar Jar is to being Afro-Caribbean. If you want to mix your Star Wars with campy gay stereotypes from the 1970s, Ziro is your alien. Now you can enjoy even more of the weirdness that is Ziro by playing a flash game that StarWars.com has unleashed upon the webosphere. Create your own Ziro monologue, daaahling, by grabbing choice quotes from the show and slapping them together in a sound mixer. Create the ultimate gay alien mashup! I'm not sure why I enjoy doing this so much, but I do. Is that so wrooooooong? If Ziro isn't really your obsession, you can always mashup the dialogue from dozens of other Star Wars characters using the Star Wars Soundboards.